In this post I’ll be explaining how to place your own ads into Facebook Instant Articles (FBIA) regardless of what kind of website you have. Back in April of last year, AdPlugg launched its support for Facebook Instant Articles (read more here: Facebook Instant Article Ads). In that post, we explained how to place AdPlugg ads into your Facebook Instant Articles feed but the post primarily focused on WordPress. 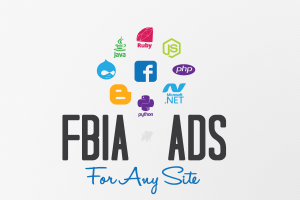 In this post, I’m going to explain how to insert AdPlugg ads into the FBIA feed for any site (regardless of language, platform, etc). Note: if your site runs on WordPress, I’d recommend following the instructions in the previous post instead of using the instructions here. First a little background – you need to have a decent understanding of how Facebook Instant Articles works in order to start tackling things like inserting ads. Facebook Instant Articles is pretty much just a feed reader. You publish a Facebook Instant Articles feed on your website (at say /feed/instant-articles) and Facebook reads the feed and displays the contents to the user from within the Facebook mobile app. Rather than having to leave the app to go to your website, your article’s content (text, images, etc) is shown to the user using the FBIA reader. Because this means the user never goes to your site, Facebook allows publishers to include ads in their feed (in addition to text, images and other standard content items). Creating a FBIA feed is going to vary depending on what platform your site is built on. The main reason why our previous post was based around WordPress was because there is a WordPress plugin that creates a FBIA feed for you. We integrated our WordPress Ad Plugin with the Facebook Instant Articles for WP plugin and that made the whole setup pretty simple. If you aren’t on WordPress, how you create your Facebook Instant Articles feed is going to vary. If you have a custom made site, you may have to custom code your Facebook Instant Articles feed. If you use a CMS other than WordPress (Joomla, Drupal, etc), there may be a plugin available that generates a Facebook Instant Articles feed for you. If you have info on how to create Facebook Instant Articles feeds for other platforms, please post the info to the comment section below to help other readers. If you plan to program the feed yourself for a custom built site, the official docs from Facebook are the best place to start. If your site is built on PHP, Facebook has a FBIA SDK for PHP that they’ve published to github. Create an Ad Zone for your feed, name it something like “FB Zone 1”. Create an Ad and target it to your Zone. Change the access code, zone name and sizes in the code above to match your account and requirements. To troubleshoot, make sure that the iframe src that you are trying to load works. You should be able to put the src url right into a browser and your ad should appear. If it doesn’t, check your url and your AdPlugg settings. You can use the feed from this blog as an example of what a finished feed would look like. You can see the AdPlugg Blog’s Facebook Instant Articles feed here. Tip: search the feed for the phrase “op-ad” to see where the ad tags were inserted. For more info regarding how to place ads into you Facebook Instant Articles feed, you should check out the official documentation from Facebook. As you read, you’ll likely discover just how powerful combining AdPlugg with Facebook Instant Articles is. Have questions, comments or need help? Post to the comments section below or feel free to contact us. This entry was posted in Publishing and tagged ad server, facebook instant articles, fbia. Bookmark the permalink.